13. Albania’s forty years of isolation from the rest of the world, combined with its disastrous economic, social and political situation, have had a traumatic effect on its citizens. They feel overwhelmed by hopelessness in the face of Albania’s domestic situation, and although their knowledge of other countries is based solely on what they have heard, or seen on Italian television, they long for the opportunity to start a new life abroad. 14. This general mood became evident after mid-1990 when increasing numbers of asylum-seekers started to leave the country. Distressing images reminded the public in the rest of Europe of a part of the continent which they had forgotten existed. 15. In July 1990, Western embassies in Tirana were besieged by large numbers of Albanian nationals. Some 5 000 people sought to leave the country. Thanks to the mediation of international organisations, and after intensive negotiations, a large number of them managed to obtain visas and were granted political asylum in several European countries, particularly Germany, Italy and France. Some have apparently since returned to Albania. 16. At the end of 1990, some 3 000 Albanian nationals had arrived in Greece by crossing the border between the two countries without meeting any resistance from Albanian border guards. By mid-March 1991, 20 000 Albanians, many of them of Greek ethnic origin, were estimated to have entered Greece. Some of these Albanian nationals have applied to the Greek authorities for political asylum. However, interviews of asylum-seekers have shown clearly that the exodus was not politically motivated but directly linked to the difficult situation prevailing in Albania. The Greek authorities granted work permits to those who found a job and temporary residence permits to the others. Repatriation programmes for all those wishing to return voluntarily were carried out in close co-operation with the Office of the United Nations High Commissioner for Refugees (UNHCR). 17. On 5 March 1991, a large number of Albanians gathered before the German, French, Greek and Italian Embassies in Tirana, where it was rumoured that visas were going to be distributed. The following day (according to various sources), several boats left the Albanian port of Durres with 20 000 Albanians on board. 18. On 7 March 1991, Albanian ships began arriving at ports in southern Italy (Brindisi, Bari, Otranto and Monopoli). In spite of the Italian authorities’ public refusal to allow the Albanians to land, many managed to do so. 19. On the following day, 8 March 1991, hygiene on the boats had deteriorated to such an extent that landing was unavoidable. Crowds of Albanians settled on the quays of Italian ports to await aid which took several days to arrive, as the Italian authorities were overwhelmed by their sheer number. 20. 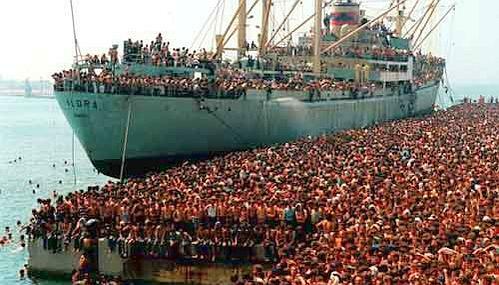 The Italian authorities claim that 20 000 Albanians arrived in Italy between 7 and 10 March 1991. Negotiations between the authorities in Tirana and Rome subsequently brought the exodus to an end, and Italy has undertaken to discuss with Albania how to eliminate its root causes. 21. Also in March 1991, an undetermined number of Albanians of Serbian and Montenegrin origin attempted to enter Yugoslavia illegally. 22. In June 1991, the Albanian authorities requested the United Nations Development Programme to organise an interagency mission in order to undertake an assessment of Albania’s urgent humanitarian needs. In the field of migration, the mission concluded that the great majority of Albanians who had left the country were seeking improved economic conditions and recommended to the Albanian government that it provide incentives so as to encourage Albanians to remain in their country. 26. After several hours of waiting in the port of Bari, the Italian authorities allowed the Albanians to disembark for humanitarian reasons and led them to La Vittoria Sports Stadium. As the Italian authorities started forced repatriation using military transport planes and ferries, clashes broke out between policemen and Albanians. The Albanians barricaded themselves in the stadium refusing to return to their country; some 300 succeeded in escaping. 27. The Italian authorities offered the Albanians 50 000 lire (40 US dollars) each and new clothes if they would return home. As this offer did not attract the Albanians, forced repatriation continued. 28. At the same time the Italian Government increased its financial aid to Albania. Right after the repatriation operations food and emergency aid was sent to Albania. On 12 August 1991, the European Community announced an extra 2,3 million US dollars of emergency aid to be used to buy food and medicines. 29. The large majority of Albanians arriving in Italy were claiming to be looking for work and escaping the poor economic situation in their country. The failure to repatriate the 7 000 Albanians who arrived in March 1991 as well as rumours of an immigration agreement between Albania and Italy seemed to encourage this last flow. 30. All of Europe witnessed the dramatic scenes, captured on television news, showing the Albanians being expelled by Italian officials. Although repatriation was legally justified, the way in which the operation was conducted was problematic. The vast majority of the Albanians, according to their accounts of the exodus, fled their country because they felt “buried alive” there. They explained that when the news spread like wildfire that it was possible to leave Albania, lorries were seized in the ensuing rush, ships commandeered, and their crews forced to set sail. It was a form of mass psychosis. It is difficult to determine whether this psychosis was triggered deliberately; rumours suggest that this was the case, but there is no conclusive evidence to support this. 31. The Albanians’ deportation from Italy was beset with problems, and on a number of occasions the police were deployed. The Albanians were particularly distressed to find that despite promises from the Italian authorities to allow some of them to travel to new homes in Italy, they were still sent straight back to Albania. 32. It should be noted, however, that the Italian authorities provided the Albanians with food, clothing and some money. 33. Although there was remarkable sympathy for the Albanians in Italy, the official Italian position was that these persons were seeking economic betterment in Italy and consequently could not be considered as political refugees. – the need to promote, in the mid-term, the reinsertion of returning Albanians, through appropriate vocational training before their return. 35. It must also be recalled that, at the request of the Italian authorities, IOM and UNHCR, in conjunction with the Italian Red Cross, established a programme of voluntary return. As at the end of August 1991, 1 130 Albanians had been assisted by IOM in their voluntary return. The programme was financed by the Italian Government. 36. By the end of December 1991 more than 200 000 Albanians were estimated to have left their country since the exodus began in July 1990. However, the UNHCR considers this figure could be substantially higher.